2013-2014 CCC defensive lineman Takkarist McKinley will soon be playing for the Atlanta Falcons. USA Today declared McKinley “the star of the NFL draft” as the 2017 NFC champions swapped first-round and gave up third- and sixth-round picks to snag him. 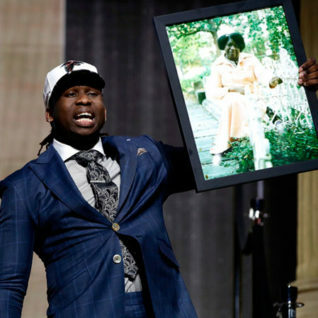 McKinley became an instant fan-favorite at the draft, when he met reporters with a large, framed photo of his grandmother in his arms. She raised him here in Richmond, often struggling through pretty tough times. On her deathbed, he promised to make it to Division I of college football’s NCAA. He did better than that, though: a phenomenal senior season performance at UCLA made him the university’s only first-round NFL draft pick. Due to an injury, he’s expected to ease into the Falcons preseason schedule, but be sure to keep an eye out for him as the season approaches.